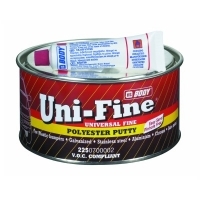 HB Body UniFine 2K Polyester Filler Stopper 1.5kg. ThisFine polyester filler-stopper is suitable for application over all metal surfaces (galvanized steel, aluminium, stainless steel, bare metal, chrome), plastic bumpers (excluding PE), polyester substrates and existing painted surfaces. HB Body Stopper provides a High quality filling of minor or deep dents. Extremely easy to sand with P150-400 grit paper for a perfect pinhole free finish.